RDS is contracted by the City of Semmes for business license processing. They are available to answer all questions at 800-556-7274. If needed, call City Hall at 251-649-8811. Our City Clerks is trained and knowledgeable in business license processing. Renewal fee for a business license is based upon the gross receipts of the business for the prior year. This information can be verified with the IRS. It is imperative to be as accurate as possible to avoid penalties and interest. Business licenses will be cancelled if there are any past due balances, etc. Any business outside of the corporate (city) limits but doing business within the 1.5 mile police jurisdiction shall pay one-half of the amount of the license imposed. It is suggested that every business obtain a license through RDS, however a license may be purchased at City Hall Monday-Friday 9am-5pm. Cash and checks accepted. No credit or debit cards. 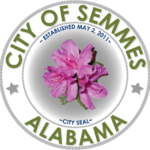 City of Semmes business licenses are also required for home based businesses operated within the city limits. Home Businesses require business license.